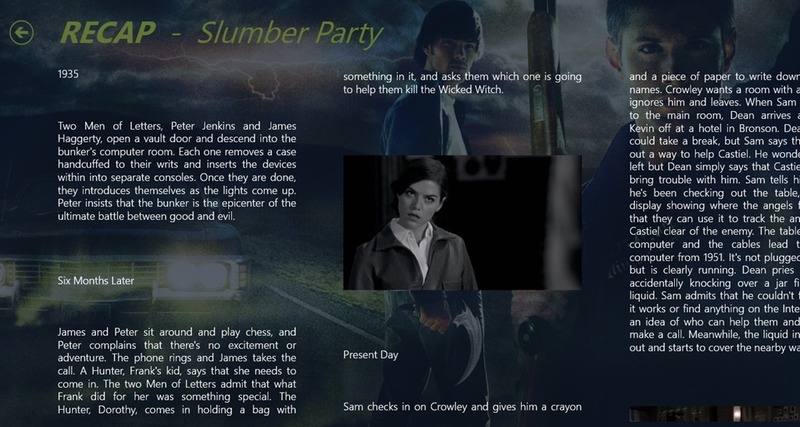 Supernatural (Unofficial) is a Windows 8 Entertainment app. 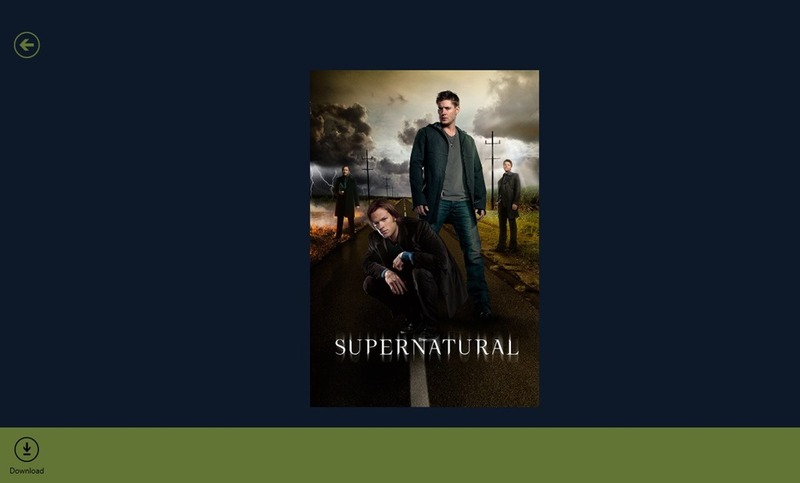 You can use it to access Banners, photos, and Episodes information from Supernatural TV Series. The app is freely available in the Entertainment category of the Windows Store. This Windows 8 Entertainment app will provide you with all the information that fans usually carve for, using the web. 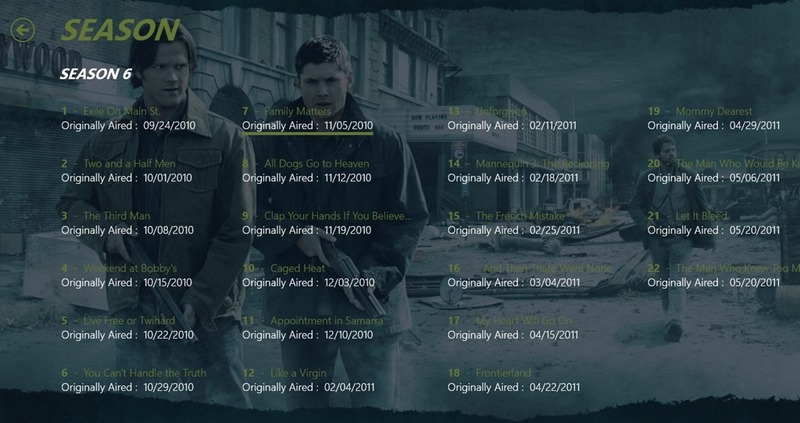 That’s right, you won’t have to waste hours over the internet to search for stuff about Supernatural. The app allows you to save banners and photos that are available here. You even can share stuff using the Windows 8 share charm. Let’s get you better introduced with this app. On the main screen of this Windows 8 Entertainment app, all the resources that are available for you would be displayed. They will be grouped into categories, namely Episode info, Episode guide, Media, and Cast. 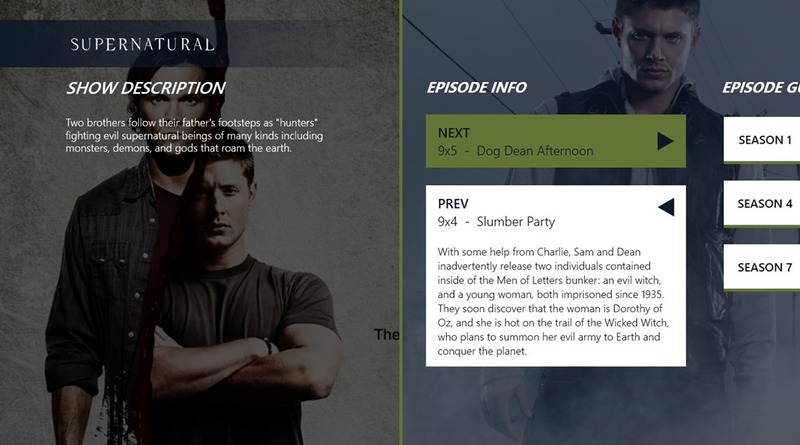 In the Episode Info category of this Windows 8 Entertainment app, you can see the details of the latest Supernatural episodes. A good detail is given here, along with good quality photos and pictures. In this category of this Windows 8 Entertainment app, all the seasons are available. 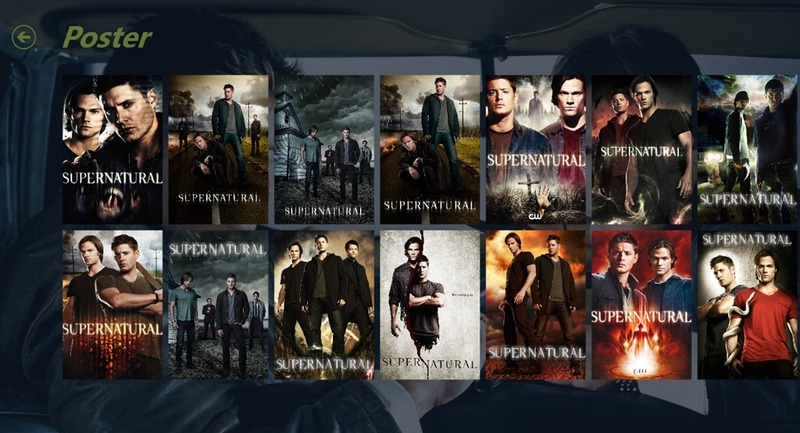 Get to any season and all the episodes available for that season would be displayed in front of you. You can choose any of the episode and read detailed story. The media category of this Windows 8 Entertainment app is further divided into sub categories namely Banners, Fan arts, and Posters. You can check out the Posters, banners, and Arts submitted by fans and can save them to your local storage. Click on any of the media images available from this category and option to download it will appear. You can Download the Posters and other stuff that are available here and they would be saved as JPEG or PNG file. In the Cast category, all the cast of the entire series is available. You can use the Windows 8 Share charm to share the stuff that is available from this Windows 8 Entertainment app. You can either send the screenshot, the details about a particular episode, or link for this app over the Internet. Also check Looney Tunes App and The Big Bang Theory App. This windows 8 Entertainment app is freely available in the Windows Store. 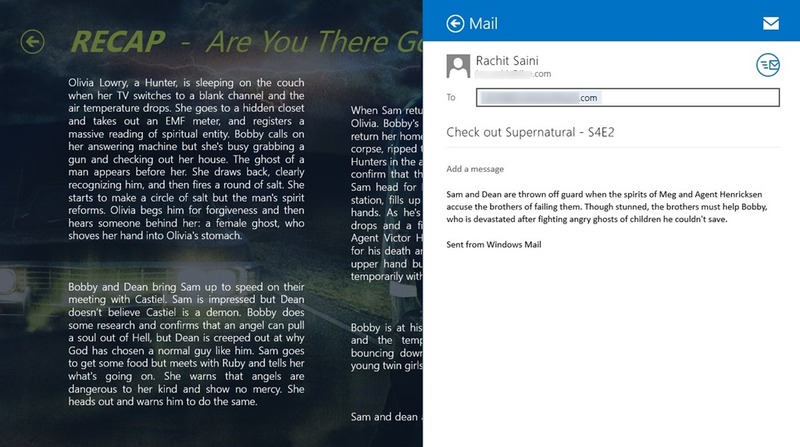 Nice Interface: The Interface of Supernatural (Unofficial) is quite nice. It uses good quality Photos and Images. Share stuff: The Windows 8 Share Charm can be used to share the resources like photo and banners with others over the internet. Save Resources: You can also save Pictures , Banners, and other images on your local storage in JPEG and PNG format. Finally, I would like to say that this app is nice to some extent. It provides you with the ability to view, save, and share only text and images. There is no facility for viewing any related videos though. But it works out for me. Give it a try.